This entrée is not only a family pleaser, but is quick and easy to make that it can be whipped up on any busy week night! Lemon Infused Extra Virgin Olive Oil is being used and can be ordered on-line at Spicewood Food . Ingredient amounts serve four. Cook pasta per package directions. While pasta is cooking, heat lemon infused olive oil over medium high heat and add chicken and onions. Sauté until browned, add spinach and sauté until wilted. Add salt, capers and lemon infused oil. Sauté until all ingredients are evenly coated. 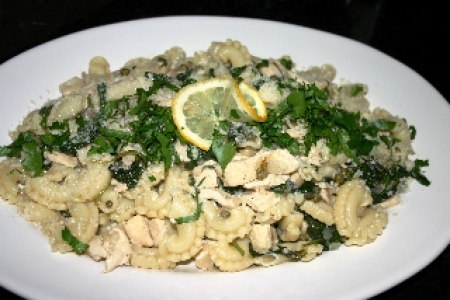 Once pasta is done, drain and add to chicken mixture, toss, top with parsley (if using) and parmesan cheese and serve. Try Pomelo Sauvignon Blanc (California), Bellerive Garda Pinot Bianco (Italy), Brancott Vineyards Marlborough Sauvignon Blanc Vintage 2007 (New Zealand), Samuel Adams® Hefeweizen (Boston, MA) with a lemon wedge, Saint Arnold Hefe-Weizen Wheat beer (Houston, TX) or Flensburger Brauerei Weizen Wheat Beer (Germany) with lemon wedges.